I almost had a true crisis this weekend - my oven broke!!! Well it kind of broke. There is a problem with the starter box and when the oven is plugged in, it makes a non-stop clicking noise that is very annoying and very freaky when you don't know what it is! When it happened I literally almost called 9-1-1 (Pat was also away this weekend, just my luck) but then I found the Super and he came up and unplugged it, and showed me how to light the stovetop with a grill lighter. So I am happy to report that all is well with my oven and a crisis is averted. Even though we now have to light the stovetop with a match or flame of some sort (and do a weird unplugging-replugging thing for the oven) it is still working and we can make food. PHEW. Last week was NUTS and all I wanted to do was eat a plate of cookies. Luckily, this weekend I was 1. dog sitting (because doesn't that make everything better?) and 2. going to a cookie swap at The Feed Feed with Bob's Red Mill. I busted out my Noni's old pizzelle maker and whipped up a batch of them, which is actually like 50 pizzelles, and I was ready. The cookie swap was so fun and I was happy I could catch up with my friend Madeline, who was in from Texas, and meet some new people! The highlight was probably seeing Sarah Kieffer's pan-banging chocolate chip cookies in the flesh. Naturally, I came home with a carton of cookies (that will be making my co-workers thrilled) and some awesome swag including Sarah's cookbook. I can't wait to check out some of the recipes. It's time for the Second Annual Virtual Cookie Swap! Last year Madeline and I decided to pull together a bunch of bloggers to share cookie recipes and I'm so glad we decided to do it again. The holiday baking season is one of my favorite time's of year - and does anyone else always plan a cookie swap with their friends every year? It is so much fun and I love seeing new cookie recipes and trying new things. Even though this cookie swap doesn't actually involve swapping, it's fun to get a bunch of people together who love baking, to celebrate something on the same day. I had a really hard time deciding which cookie I wanted to share for this year's swap. THERE ARE TOO MANY COOKIES TO CHOOSE FROM!! The stress is real. 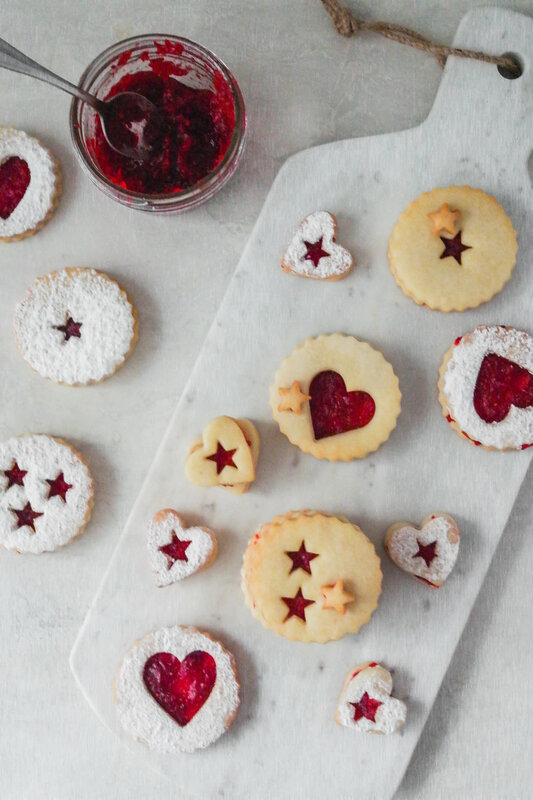 But, I'd been seeing linzer cookies all over the place and when I saw this recipe on Hummingbird High, I wanted to try making them. I swapped out some of the ingredients, and went a cranberry route (since you all know I have a never-ending supply of cranberries this year) and they were so much fun! For this year's Virtual Cookie Swap, we have so many delicious recipes and I am loving going through them all. The full list is below and follow along on Instagram using #CookieSwapParty. In a large bowl, combine butter, 1/2 cup confectioner's sugar, and 1/2 teaspoon kosher salt. With a handheld mixer, beat until light and fluffy. Add vanilla extract and hand mix. In parts, add flour and continue to mix until it's combined. The dough will be a bit crumbly but will come together when pressed. Dump the dough into a sheet of plastic wrap and wrap it into a flat disk. Chill in the refrigerator for at least two hours to overnight. While the dough chills, make the cranberry quick jam by combining cranberries, water, sugar, cinnamon and lemon in a small sauce pan over medium heat. Keep stirring until it starts to bubble. Cranberries will begin to burst and soften, but you can hand crush if you want. Keep cooking until the mixture becomes thick and jam-like. When it is does, remove from heat and transfer to a heat-proof glass bowl and let cool. Pre-heat the oven to 350 F. When you're ready to roll out the dough, cut it into three chunks and roll it between two sheets of parchment paper. Roll the dough into a very thin slab, about 1/4-inch thick. If it's too hard, let it sit for 5 minutes before rolling. Using a cookie cutter of your choice (I used a circle with edges, a small heart, and a tiny star), cut out the shapes, making sure that you're cutting enough so that there are pairs. Place the rounds onto a parchment lined cookie sheet about 1/2 inch about. Gather the excess scraps into a ball and repeat the rolling out process until all the dough is used, including the remaining dough. Use a smaller shaped cutter to stamp out shapes in half of the rounds. Chill the dough in the freezer for at least 30 minutes. Once preheated, bake the cookies for 10 to 15 minutes. They will not brown so keep an eye on them. Transfer to a wire rack and cool to room temperature. 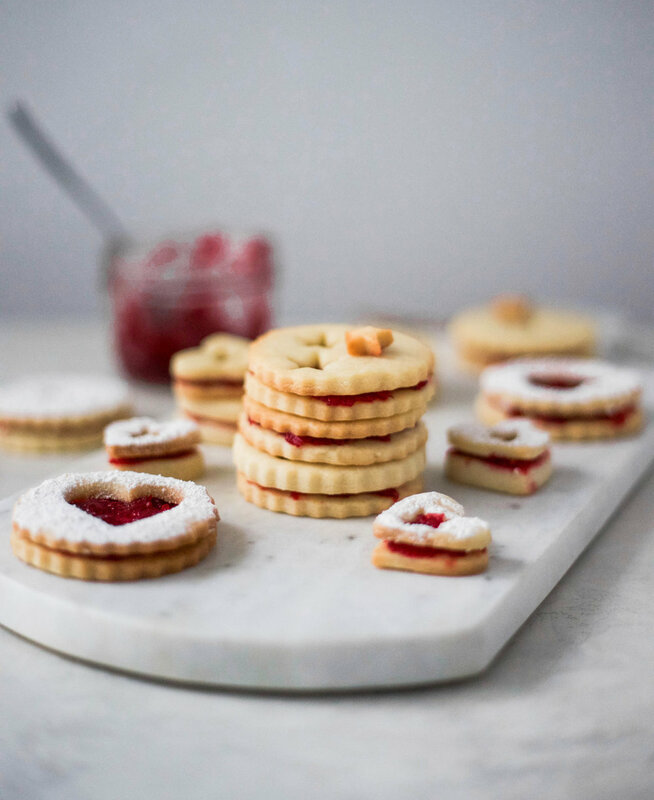 When the cookies are at room temperature and you're ready to assemble them, spread about 1 teaspoon of cranberry jam onto the un-cut cookie rounds. Top with the cut-out cookie, and garnish with confectioner's sugar, if desired. Enjoy! If you want to participate next year, shoot me an email!